I’ve decided to give the Japanese Christmas Cake another go (I have made this before, last year around June. For step by step instructions, see my old blog post here.) because I 1) named it incorrectly the first time. This is not a Strawberry Shortcake by any means and 2) I posted it in the middle of summer, when strawberries are at the peak of their season in California, but this cake is eaten so much in Japan during this winter season that I thought I should re-post it as a holiday feature. As an aside, it’s eaten extensively in Japan because strawberry season starts in Japan in December, making the fruit delicious and abundant. I don’t mean to exclude anyone from this- it’s a Japanese Christmas Cake, but obviously anyone can enjoy it. I actually think Japanese Christmas is kind of cool- while they are religious for some people, to many others Christmas is a romantic holiday, or a holiday for friends and family, more than anything. So, in a way, it’s a kind of Christmas that many people can enjoy. And one of my favorite representations of this shows up in the show Ping Pong the Animation. This show is my ideal sports anime. I’m not a huge fan of sports anime, but this one hits all the bases for me (ahaha, get it? Bases?). It does focus on the sport- and it’s a cool sport in itself, but it’s less about the sport and more about the journey the characters go through that really changes them, sometimes for the better, sometimes for the worse, and ultimately climaxing in an incredible match of ping pong. To add to that, it’s got a great opening soundtrack, unique art, and awesome music and dialogue the whole way through. One of my favorite characters from this show, Kong Wenge, is a prime example of the great character transformations that happen throughout the show. I don’t want to give too much away, but he goes through a transformation that culminates in a Christmas dinner at home with his friends and mom. Together they make wontons, and she brings out this Christmas cake for them all to celebrate with. 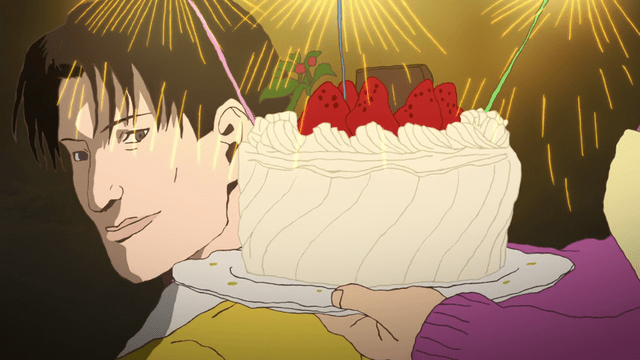 It’s such a cheerful, happy moment, I really wanted to recreate that with this cake. I wish I could share this cake with all of my wonderful readers! Sadly my room mates demolished it in two days. This cake was fantastic- mounds of whipped cream with fresh strawberries on a nice, spongey cake base. The cake itself is only slightly sweet, but the simple syrup will add more sweetness to the cake, so it ends up being the perfect amount of sweet. If you want to go overboard with sweetness, amp up the level of sugar in the whipped cream. whatever tastes best to you is the right way to do it. Strawberries might be a bit difficult to get ahold of- in California we get nice fresh fruit year-round, though even our strawberries are better in spring/summer. Japan is lucky that they get their strawberries in season starting in December, and we’ll just have to make due with what you can get this time of year. I do not recommend using frozen or preserved berries for this- using fresh is the only way to obtain the look of the berries in each slice of cake. Another note- if you go overboard on anything, use more whipped cream than you think you’ll need to. I used a whole pint and actually found that I could have used a little more to decorate the top and outer layer of the cake. I had even upped the amount of whipped cream here from my previous recipe, and still found I could have used more. This could be because I really went to town on the filling, but I also liked how nice and fluffy the filling layer was, so I wouldn’t want to change that. So yes- go overboard on the whipped cream. It’s pretty much the best part anyway. And, lastly, Happy Holidays from Yum Penguin Snacks!! It’s been such a great year food blogging for you all, so thanks for all the comments, and likes, and subscribes, and follows, and all that sort of stuff throughout the year. I’ve had such a great time, and it’s such a nice feeling to know that I’m helping people learn to cook and try new things. Check out the video below for a visual on instructions. Ingredients are listed just below. Previous Post Crunchyroll #28: Japanese Pudding from WWW.WORKING! !